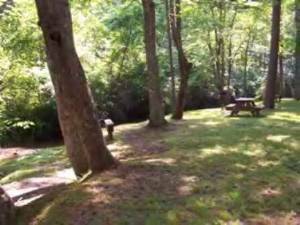 Peaceful Creek Cabin is located approximately 5 miles north of Blairsville, Georgia (only 2 hours north of Atlanta). 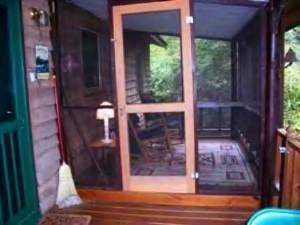 The cabin is nestled on a private acre bordered by the national forest service with end of road privacy. 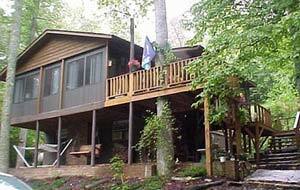 Enjoy the sounds of the creek from the upper deck, picnic on the creek bank, or relax inside by the stone fireplace. Only minutes away from shopping and restaurants, hiking trails, Lake Nottely, golf courses, waterfalls and horseback riding stables. With its central heat & air, furnished linens and full kitchen, all you need to bring are your groceries & personal items, then lock yourself away for a truly peaceful experience! Train ride through mountains 30 minutes west, several waterfalls in Blairsville area, Helen and Dahlonega 40 miles away, Vogel State Park 20 minutes south. 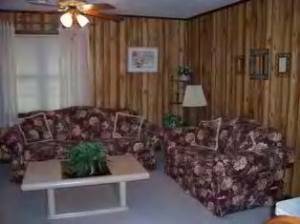 Located at the end of the road, this cabin offers great privacy! 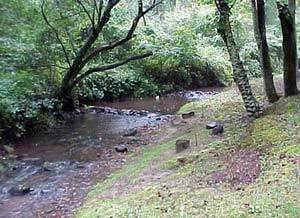 Enjoy your own private creek bank! 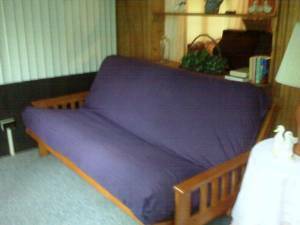 Relax in the comforts of the living room. 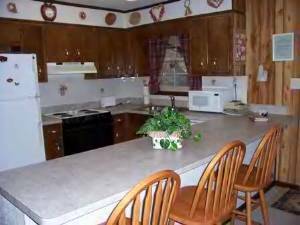 Fully equipped kitchen w/dishwasher, microwave, icemaker, all utensils, etc. 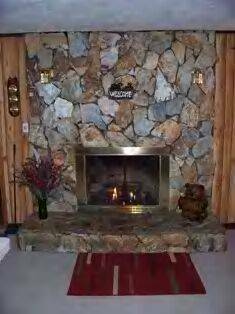 Stone fireplace has push button lighting gas logs for your pleasure! The large front yard has park like setting leading down to creek. Rocking chairs await you on the nice screened porch. 6/02/02 What a delightful cabin! We had a wonderful time. We'd love to share "Blairsville's Best Kept Secret" with family and friends, and come back ourselves! $10 per day each additional person over two guests, children under 12 free. Deposit: A deposit of $100.00 is required within a week of securing the reservation. Balance required two weeks prior to arrival. Cancellations and Refunds: If cancellation is received two weeks prior to arrival date deposit will be refunded.